Bona Mix and Fill is a water-borne filler which is perfect for trowel-filling parquetry or filling small nail holes and fine gaps between floor-boards up to 2mm. Larger gaps may need to be filled twice. Mix & Fill dries in as little as 20 minutes (25 degrees Celsius, 50% relative humidity). Mix & Fill should be mixed with 80 - 120 grit sawdust from an edger or rotary sander to the desired consistency for trowel-filling or spot-filling. Excess filler sands away easily with a 100 grit abrasive. Mix & Fill is a waterborne joint filler designed to be mixed with sanding dust to a suitable colour. 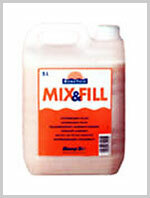 Mix & Fill is used to fill joints up to 2mm in width and other minor defects in wooden floors. It can be used with all Bona wood floor finishes and oils and gives the flooring contractor the possibillity to offer a complete waterborne system. Application rate: Approx. 10 sqm/litre This depends upon the quantity/depth of the joints.